(Nanowerk News) In campy old movies, Lucretia Borgia swans around emptying powder from her ring into wine glasses carelessly left unattended. The poison ring is usually a confection of gold filigree holding a cabochon or faceted gemstone that can be broken to empty the ring's contents. It is invariably enormous — so large it is rather odd nobody seems to notice it. Lucretia would have given her eyeteeth for the "smart capsule" devised in Younan Xia's laboratory at Washington University in St. Louis. A tiny cage of gold covered with a smart polymer, it responds to light, opening to empty its contents, and resealing when the light is turned off. Infinitely more cunning and discreet than Lucretia's ring, the nanocage is too small to be seen — except indirectly: billions change the color of liquid in a test tube. No Lucretia, Xia is a healer rather than a poisoner. The smart nanocage is designed to be filled with a medicinal substance, such as a chemotherapy drug or bactericide. Releasing carefully titrated amounts of a drug only near the tissue that is the drug's intended target, this delivery system will maximize the drug's beneficial effects while minimizing its side effects. The method for making the capsules and tests of their performance appeared online on Nov. 1, 2009, as part of the advance online publications program of the journal Nature Materials. The first step in making a smart capsule is to mix up a batch of silver nanocubes. Tiny single-crystal cubes of silver can be made by adding silver nitrate (AgNO3) to a solution that donates electrons to the silver ions, allowing them to precipitate as solid silver. The addition of another chemical encourages the silver atoms to deposit on some parts of a seed crystal rather than others, coaxing the seeds to form sharp-edged cubes rather than misshapen lumps. A second step clips all eight corners off the cubes. The clipped silver cubes then serve as "sacrificial templates," on which the gold cages take shape. When the silver nanocubes are heated in cloroauric acid (HAuCl4), the gold ions in the acid steal electrons from the silver atoms in the cubes. The silver dissolves and the gold precipitates. A gold skin forms on the silver cubes as the cubes are hollowed out from within. The silver atoms enter solution through pores that form in the clipped corners of the cubes. "But the really cool part," says Xia, "and the cool part of nanotechnology generally, is that the tiny gold cages have very different properties than bulk gold." In particular, they respond differently to light. The physicist Michael Faraday was the first to realize that a suspension of gold particles glowed ruby-red because the particles were extremely small. "His original sample of a gold colloid is still in the Faraday Museum in London," says Xia, Ph.D., the James M. McKelvey Professor in the Department of Biomedical Engineering. "Isn't that amazing? It's over 150 years later and it's still there." The color is caused by a physical effect called surface plasmon resonance. Some of the electrons in the gold particles are not anchored to individual atoms but instead form a free-floating electron gas. Light falling on these electrons can drive them to oscillate as one. This collective oscillation, the surface plasmon, picks a particular wavelength, or color, out of the incident light, and this is the color we see. The strong response at a particular wavelength, called resonance, is what makes a violin string vibrate at a particular pitch or lets a kid pump a swing high in the sky by kicking at just the right moment. What's more, the surface plasmon resonance is tunable in much the same sense that a violin is tunable. "Faraday used solid particles to make his colloid," comments Xia. "You can tune the resonant wavelength by changing the particles' size, but only within narrow limits. You can't get to the wavelengths we want." The wavelengths he wants are the ones at which human tissue is relatively transparent, so that cages in the bloodstream can be opened by laser light shone on the skin. 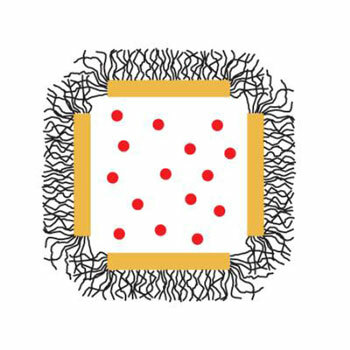 The color of nanocages can be tuned over a wider range than solid particles by altering the thickness of the cages' walls, says Xia. As more gold is deposited and the shells thicken, a suspension of nanocages shifts from red, to purple, to bright blue, to dark blue, to the wavelengths in the near-infrared. Xia's team wants to hit a narrow window of tissue transparency that lies between 750 and 900 nanometers, in the near-infrared. This window is bordered on one side by wavelengths strongly absorbed by blood and on the other by those strongly absorbed by water. "People used to do a demonstration at talks," Xia says, laughing. "They'd put a red diode laser in their mouths, and the audience could see it from outside, because the diode's wavelength is 780 nanometers, a wavelength at which flesh is pretty transparent." Here things get even trickier and yet more amazing. The resonance actually has two parts. At the resonant frequency, light can be scattered off the cages, absorbed by them, or a combination of these two processes. Just as they can tune the surface plasmon resonance, the scientists can adjust how much energy is absorbed rather than scattered by manipulating the size and porosity of the nanocages. Xia illustrates the difference between scattering and absorption with a marvelous Roman artifact, the 4th-century Lycurgus Cup. The cup looks jade-green from the outside but turns pink when lit from the inside. Modern analysis shows the ancient glass contains nanoparticles of a silver-gold alloy that scatters light strongly at a wavelength in the green part of the spectrum. When the cup is lit from inside, however, the green light is absorbed, and we see the remaining light, which is predominantly red, the complementary color to green. It's actually the absorption component that the scientists exploit to open and close the nanocages. When the light is absorbed it is converted to heat, and the nanocages are covered with a special polymer that responds to heat in an interesting way. The polymer, poly(N-isopropylacrylamide), and its derivatives has what's called a critical temperature. When it reaches this temperature it undergoes a transformation called a phase change. If the temperature is lower than the critical temperature, the polymer chains are water-loving and stand out from the cage like brushes. The brushes seal the cage's pores and prevent its cargo from leaking out. If the temperature is above the critical temperature, on the other hand, the polymer chains shun water, shrink together and collapse. As they shrink, the pores of the cage open, and its contents flood out. "It's a bit counter-intuitive," says Xia. "Typically when you go to higher temperature, a molecule will expand, but this one does the opposite." Like everything else about this system, the polymer is tunable. The scientists can control its critical temperature by altering its composition. For medical applications, they tune the critical temperature to one right above body temperature (37 degrees Celsius) but well below 42 degrees Celsius (107 degree Fahrenheit), the temperature at which heat would begin to kill cells. Next comes the fun part. Once they had made their smart capsules, the scientists tested them by loading them with a bright red dye called alazarin crimson, or rose madder. The dye made it easy to detect and measure any release with a spectrometer. The cages were loaded by shaking them in a solution of the dye at a temperature above the critical temperature of the smart polymer. Next, they were dunked in an ice bath to trigger the polymer to close the pores and trap the dye inside the cages. The cages were then opened again by bathing them in the light of a near-infrared laser. Absorbed light warmed the gold cages above the critical temperature and provoked the polymer's phase change. The polymer collapsed, the cages' pores were exposed, and dye spilled out. Next the team loaded capsules with doxorubicin, a common chemotherapy drug and, triggering the drug's release with a laser, killed breast cancer cells growing in wells on a plastic plate. And finally, they loaded the capsules with an enzyme that snips open the cell walls of bacteria and used them to kill a bacterium that is a normal part of the flora of our mouths and throats. Lucretia, eat your heart out.